This is located near Pulaski. LaDonna McCollum writes: My grams [born in 1935] was named Kathryn Baldwin Mainer. She was one of 7 children who lived there [the house seen here] and she spent her whole life in Candler County moving from picking crops to cleaning homes and then working in nursing homes and private sitting. She raised 13 children alone. When my mom was growing up there were about 10 of them in the house at that time and for most of her life they lived in a block tenant house on Rocker Plantation on Salem Church Rd. Mom and her siblings worked in the ‘bacca there when she was growing up. She doesn’t miss that at all! The tenant is still there, the residents have made some improvements over the past couple years, added plumbing, painted, did a great deal of remodeling. The old Rocker house is gone, well part of it, they used part of it for the house which is there now. My Grams was a great lady, a strong, persevering lady! Gone too soon. She along with many of my family members are buried in St. Matthews Church Cemetery. Hi Brian, I smiled when I saw you’d photographed this house. This was a wooded area up until about 3yrs ago when they cleared it & sold timber. Imagine my surprise to know there was a house hidden among the trees all these years one day when I happened to go that way. I mentioned it to my mother and she told me her mom grew up in this house! My grams was born in 1935. I just looked for the pictures I took of it right after and I took several but could only find one so far and of course it isn’t as good a quality as yours. But it’s when it was first cut so you could clearly see the house, windows and door. It grew back up around it pretty quickly as you saw when you took your picture. Have you ever seen Byrd Junior School? It’s there in Pulaski not far from what you call THE landmark home there, which I agree! I’m going to see if I can find some pictures of the school, it’s part of my family history as well, my great-great-great grandmother was a former slave who donated the land for a school for black children. The road was named after it. I will try and find those pictures and a brief history of that. Please share the history and photos if you find them, LaDonna. Thank you for sharing. 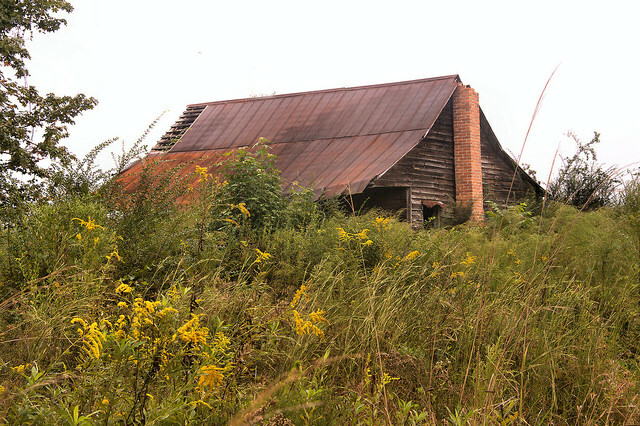 I will look for the schoolhouse and do my best to photograph it and add it to the website. Also, I’d love to know more about your grandmother who lived in that old farmhouse. Hi Brian, I’ve only found one pic of the old farmhouse so far. My grams was named Kathryn Baldwin Mainer. She was one of 7 children who lived there and she spent her whole life in Candler County moving from picking crops to cleaning homes and then working in nursing homes and private sitting. She raised 13 children alone. When my mom was growing up there were about 10 of them in the house at that time and for most of her life they lived in the block tenant house on Rocker Plantation on Salem Church Rd. Mom and her siblings worked in the ‘bacca there when she was growing up. She doesn’t miss that at all! The tenant is still there, the residents have made some improvements over the past couple years, added plumbing, painted, did a great deal of remodeling. The old Rocker house is gone, well part of it, they used part of it for the house which is there now. My Grams was a great lady, a strong, persevering lady! Gone too soon. She along with many of my family members are buried in St. Matthews Church Cemetery. That can be a trip in history in itself. One day I took the time out to visit a few of the local cemeteries and it was amazing to see some of the dates on the headstones! I will have more time coming up this week I will find my old camera and see if I can find the pics of Byrd Jr. School as well. My Grams went to school there. You’ve got a great site! I’ve been working in Swainsboro and there are several places that I see tucked among trees and weeds and everytime I pass them I’m like that’s a good old spooker for Brian’s website 🙂 When timber gets cuts all sorts of surprises can be seen. not a cracker box style house. they are shape of a cracker box. Not a cracker box, but a Cracker style…cracker box houses, like salt box houses, are less common in the South. Hi Brian! I am finally getting to take that long awaited trip back “home” next week. We will be starting from Thomasville all the way to Savannah. 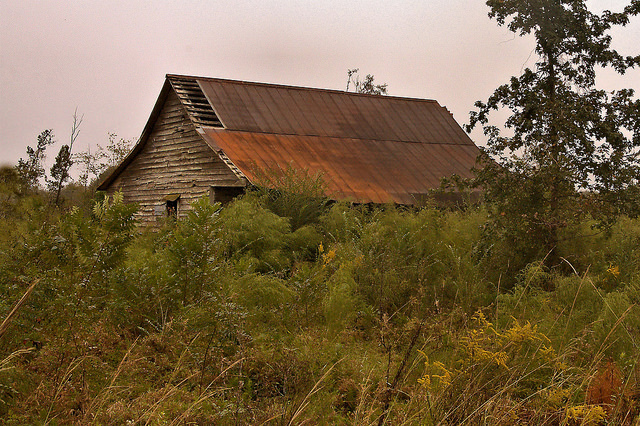 I hope to make some of the back roads and hopefully see what’s left of the many old houses and barns! Your photos have been inspiring me for several years now…thank you!